12 teams in Samsun started their quest on the basketball court for Division A survival on day 4 of the 2013 European Championship for Women Division A. With the change in the classification round format, only the eight quarter-finalists are assured a place in Division A next season. In Group F, France and Turkey have punched their tickets for the quarter-finals by beating Germany and Russia respectively. Italy should join them with one more victory, while the battle for the remaining place is still wide open between Germany, Russia and Sweden. In Group E, Spain are the runner away leaders still undefeated after seeing off Belarus (83-72). Spain still need one more victory to be 100% sure of qualification. With all the teams having at least one victory the qualification puzzle is complex as all six teams can still qualify. France had an easy victory against Germany (63-30) with everybody getting on the score sheet. France led from start to finish and took control for good with a 9-0 run to finish the first quarter (25-11). Grégory Halin, the French coach, was able to rotate players with nobody playing more than 21 minutes. Sara Chevaugeon and Christelle Diallo were the top scorers with 11 and 10 points each. Turkey were given a tough test by Russia and trailed (10-13) by the end of the first quarter. Russia kept the pressure on their hosts but faded during the last five minutes of the second quarter. Turkey were able to regain control with a couple of big three-pointers by Elif Emirtekin and Özge Kavurmacioglu that gave them a 9-point cushion at the break (30-21). Russia won the battle of the boards. However their finishing is still off. Turkey, on the other hand, with a huge support held on to the lead the rest of the way for victory (52-43). Italy played well defensively and turned the ball over just 9 times in their win against Sweden (66-47). Once again Francesca Dotto was the driving force with 17 points. One more victory for Italy and they qualify for the quarter-final. For Sweden Josefin Vesterberg continues to fill the stats sheet, this time with 17 points, 15 rebounds and 7 blocks. Spain have one foot in the quarter-final after seeing off Belarus in a final-quarter shoot-out with 34-26 to win the match (83-72). Spain relaxed a little too much after a dominating first quarter (24-8). With Belarus challenging they were then forced to battle it out for the remaining 30 minutes. 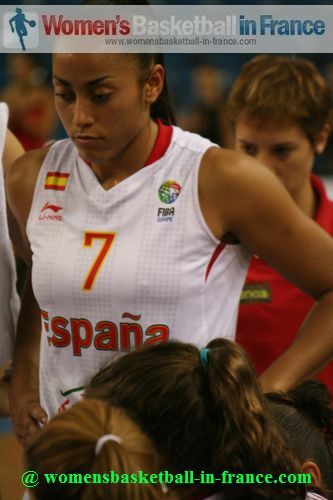 Astou Ndour led Spain once again, this time with 19 points and 10 rebounds, while Paula Estebas and Inmaculada Zanoguera (in picture) scored 15 apiece. For Belarus Darya Lipinskaya and Katsiaryna Urbanovich scored 14 and 12 points respectively. The Netherlands blew a 20-point lead to allow Greece to take the victory (56-50). Artemis Spanou was again a major factor with 25 points, 17 rebounds, 6 assists and 3 steals. 19 consecutive points at the start of the third quarter was all Serbia needed to overcome the Slovak Republic (54-43) in the opening game of Group E.